The Lexus RX has the savvy and ability to do it all. It's both luxurious and sporty, all while maintaining an air of practicality. Lexus made the choice to sell the RX with only two rows of seats. The upshot is that the interior of the Lexus RX feels cavernous, offering up the kind of rear seat legroom that's more commonly found in luxury cars. All this, despite still offering plenty of cargo space behind the rear seats. Engine options are powerful and smooth, while its ample ground clearance allows for light off road duty when needed. With a base price starting around $43,000, the Lexus RX competes with other SUVs on the market from luxury manufacturers like BMW, Audi and Mercedes-Benz. Bold styling; available all-wheel drive; SUV pretensions; premium comfort levels; modern and refined engine options; hybrid model. The Lexus RX comes in two basic forms: RX 350 and RX 450h. The RX 350 is powered by a smooth 3.5L V6 engine and produces 295 horsepower. With this engine, 60 mph arrives in under eight seconds, and the RX 350 achieves 28 mpg on the highway in front-wheel drive trim. The RX 450h combines a traditional gasoline engine with an electric motor for a total of 308 horsepower. Highway fuel economy climbs as high as 30 mpg for the front-wheel-drive models. The only transmission available is an 8-speed automatic, and all-wheel drive is optional on either version of the RX. Both the RX 350 and the RX 450h are also available in F SPORT guise, further enhancing both the interior and exterior styling, while also tightening up the handling. The F SPORT package adds an 8-inch LCD display instrument cluster, unique quilted seats, adjustable suspension, interior aluminum trim accents and drilled aluminum pedals. Outside, the F SPORT gets a blacked-out grill, plus exclusive 20-inch wheels. 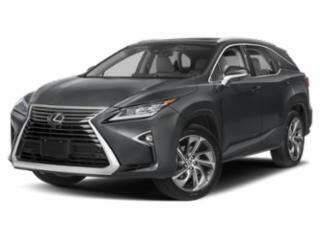 Option packages available on the RX 350 include a Luxury Package with perforated leather seats, a nicer powered driver's seat, 20-inch wheels, a heated steering wheel and Gray Sapele wood trim. A Navigation Package adds a 12.3-inch color screen for the navigation system, a 15-speaker Mark Levinson sound system, voice command, a DVD player, dual-zone climate control and Lexus Enform app suite. A Lexus Safety System package includes a pre-collision system with pedestrian detection, dynamic radar controlled cruise control, a lane-keep assist and lane departure warning system, intelligent high beam headlights and premium triple beam LED headlights. The Lexus RX returns for 2019 with no big changes.